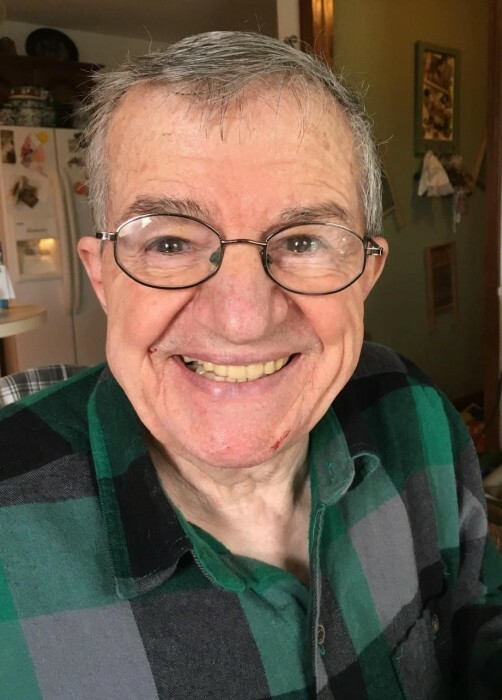 Daniel D. Maxfield, Sr. passed away Friday, November 30th 2018 at his daughter Brenda's (Kevin Irving) home, 20 Skyline Drive, Oswego, surrounded by his loving family after a courageous battle with Alzheimer's. Born in Speedsville, just outside of Caroline Center, NY, April 26, 1933 the son of the late Christopher and Josephine (Pinayza) Baiguini, and adopted son of the late Olin and Hester Maxfield, he resided at 1312 Gallagher Road, Cortland. He retired from Pall Corp of Cortland in research and development for over 30 years. He was previously employed as Herd Manager of Frandor Sears Farms, Cortland and before that was a boat construction technician at Thompson Boats of Cortland shortly after his service in the U.S. Air Force during the Korean Crisis. As a faithful Christian, Dan was a loving and devoted husband to Phyllis Joanne (Kline) with a loving marriage of 64 years and a loving and devoted father. He enjoyed his family, grand, and great grandchildren, friends, co-workers and colleagues. He enjoyed relationship building through hunting, landscaping his yard, feeding the birds that frequented the back yard, and floral arts and crafts with his bride. He leaves behind an unequaled legacy of love. We will miss his wisdom, encouragement and enthusiasm as he loved to sing Christmas Carols in July. Daniel is predeceased by his parents and his sisters, Ida (Baiguini) and Mary (Grande) of Cortland. Surviving are his loving wife, Phyllis, four daughters, Marcia (David Hicks); Josephine (Randy Widrick); Annette (Larry Gathmann); and Brenda (Kevin Irving); two sons, Daniel Jr. (Sue Ellen Riehlman) and Christopher (Beatrice Labella); several grandchildren and great grandchildren. Also surviving are three sisters, Theresa (Don Slattery of Ithaca); Rose (the late Al Vecellio of Cortland), Sylvia (the late Robert "Bobby" Mullen and presently, George Willis of Rochester) and several nieces, nephews and cousins. Special thanks to our parents for their legacy of love and family, to Dr. Michael Niziol and his wonderful staff at Family Practice in Dryden, and the Syracuse VA medical team who were faithful to the end. To all of you, our greatest and deepest gratitude. Memorial services will be held at 4:00 p.m. on Tuesday, December 11, 2018 at Grace Christian Fellowship, 1250 Fisher Ave., Cortland, NY. Calling hours will be held at the church on Tuesday from 2:00 p.m. to 4:00 pm immediately followed by the service. Those wishing to remember Daniel in lieu of flowers may make a monetary donation where he worshipped the Lord to Grace Christian Fellowship, 1250 Fisher Ave., Cortland NY 13045. Contributions will be shared between Grace Fellowship and the organizations that have nurtured and assisted the family through Daniel's illness.